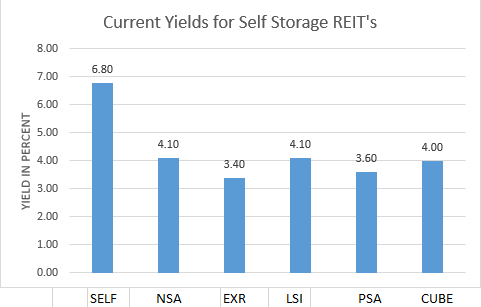 The performance numbers for 2018 are all in for each of the publicly-traded self-storage REITs. Using closing market prices on 4/10/2019, we can apply valuation techniques for each participant. Value analysis will argue for taking a specific long position. 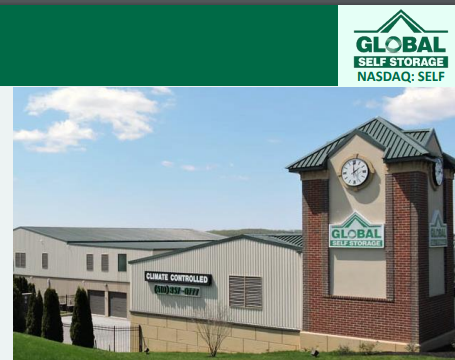 A few days ago, we just received all the annual outcomes for the six publicly-traded self-storage REITs: Global Self Storage (SELF), Public Storage (PSA), National Storage Affiliates (NSA), Extra Space Storage (EXR), CubeSmart (CUBE), and Life Storage (LSI). In what follows, I will be referring to data taken from the associated Press Releases available here for SELF, PSA, NSA, EXR, CUBE, and LSI. I will also be referring to the Annual Report for PSA, the Corporate Presentation for SELF, and the Financial Supplements for CUBE, NSA, EXR, and LSI. Market prices will be taken as of the close on 4/10/2019. Based upon the ratio of price to FFO, the market clearly values SELF at a substantial discount to the industry. All the remainder are relatively clustered together. The substantial discount for SELF is unjustified, especially in light of its industry-leading growth performance logged during 2018. 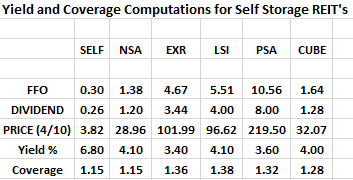 SELF should be priced at least at the average of all the non-SELF REITs in the industry (at 20.13x FFO). This implies a price per share of $6.04. 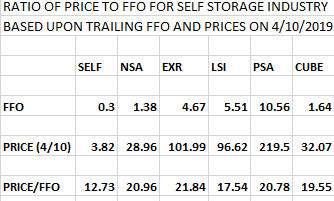 Hence, SELF (with a $3.82 price) is trading at a discount to intrinsic value of 36.75%, based upon FFO. First, note that the dividend coverage ratios for the industry are in a relatively narrow range, with an industry average of 1.27x. Both SELF and NSA bear equal coverage ratios of 1.15x. This is appropriate, as SELF and NSA demonstrated the best FFO growth rates during 2018. Most apparent is SELF's market yield of 6.80%, a full 296 basis points above the average of the remainder in the industry (at 3.84%). Just as in the FFO valuation, SELF is illegitimately discounted. With its unequaled operational performance during 2018, SELF should be priced with a yield of no less than 3.84%. This renders a minimum price of $6.77. So, SELF is trading at a discount to intrinsic value of 43.6%, based upon yield. First, let us build a table by extracting data from the sources mentioned in the first paragraph of this article. 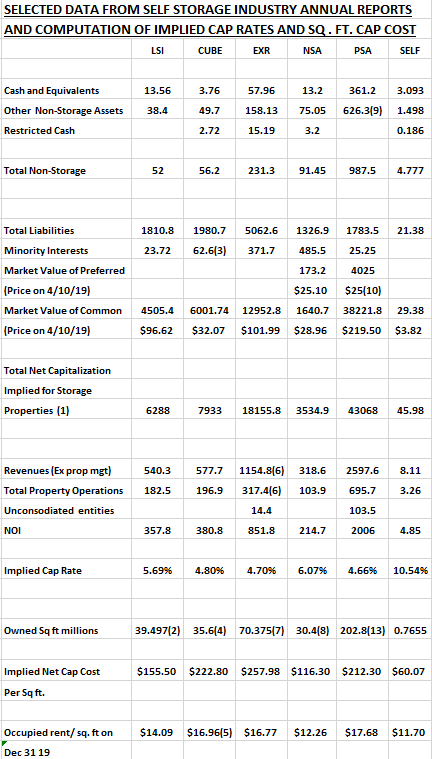 The above table endeavors to isolate the NOI associated specifically with property owned by each REIT and pair it with the corresponding respective appropriate market values (including equity, preferred, liabilities and minority interest, net of other assets) that effectively fund the property owned. Please see the footnotes that explain several subtle adjustments that were required in this laborious and meticulous ordeal. In so doing, we end up with an NOI and its embedded market value. This permits us to derive an implicit cap rate for the portfolio of properties owned by each REIT. The important results are shown below in the next table. The third line (Implied Cap Rate) applies to the portfolio of each REIT and is derived by dividing the second line (NOI) by the Property Net Capitalization (first line). 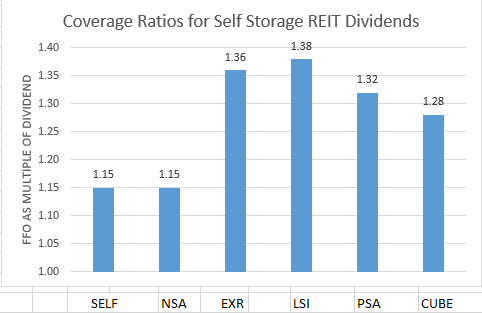 Other than the SELF outlier, the computed Implied Cap Rates seem to be in line with those contemporary published surveys for REIT-type storage facilities. 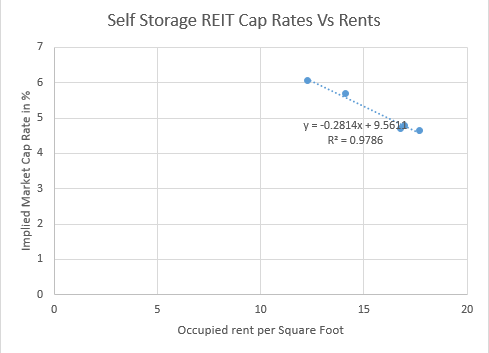 The last line is the Occupied Rent per square foot for each REIT that will now become the independent variable in a linear fit with the corresponding Implied Cap Rate, as shown below. 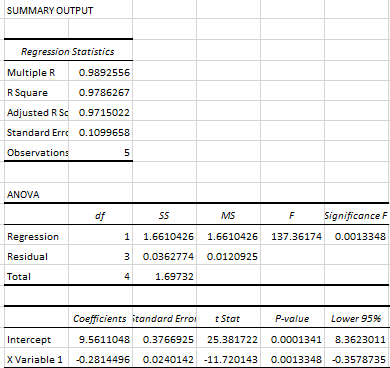 In this regression, I throw out the unusual SELF outlier of 10.54%. This arises (as explained before) from the market's excessive discounting. The results are remarkable. As the occupancy rent per sq. ft. falls from $17.68 for PSA to $12.26 for NSA, the property implied market cap rate rises in an almost perfect linear fashion from 4.66% for PSA up to 6.07% for NSA. The R-squared is 98% and the significance is almost 99.9%. Another conclusion follows as an immediate and important corollary. For each of these five REITs used in the fit, the market price of the stock very closely parallels the implied market prices of the underlying properties. 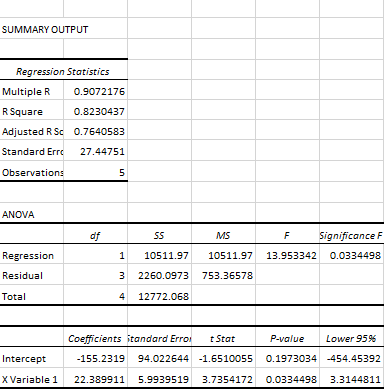 See how closely the data points are to the regression line. Hence, the market price of each stock is very close to its net asset value (liquidating value) for all cases, with the notable exception of Global Self Storage, which was not used in the fit. 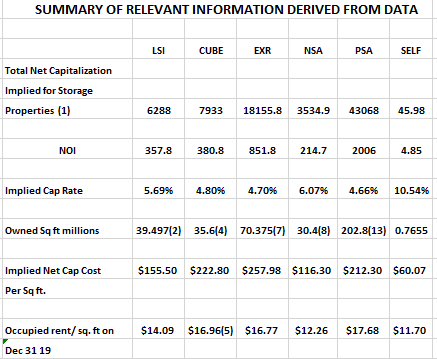 Note that this is predictably slightly more than NSA's actual cap rate of 6.07% with an occupancy rent of $12.26 and lying precisely on the regression line. Is there any material reason why SELF's implied cap rate should be at 10.54%? 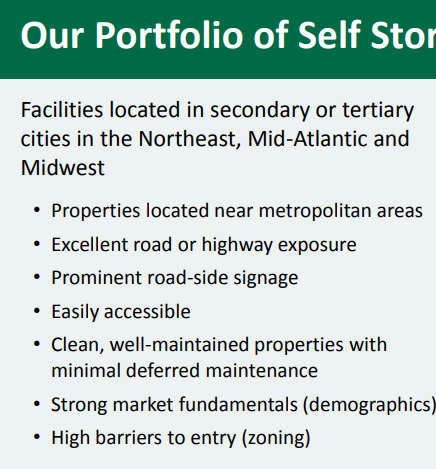 (This question is taken in context to value the property in a manner consistent with other self-storage REITs.) Please see the below excerpts taken from the SELF corporate presentation and review the property-by-property information given on the SELF website. Certainly, SELF's portfolio stands at REIT quality and, probably, deserves even a lower cap rate than the equation predicts, due to more desirable geographic locations with less new supply competition. 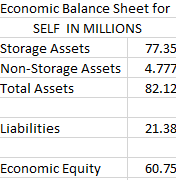 Now that we can be confident in a market cap rate of 6.27% for SELF properties, let us restate the balance sheet in economic terms. With 7.7 million shares outstanding, the NAV per share comes to $7.88. The stock is currently trading at a steep discount of 106.5%. SELF trades for less than half of its NAV. 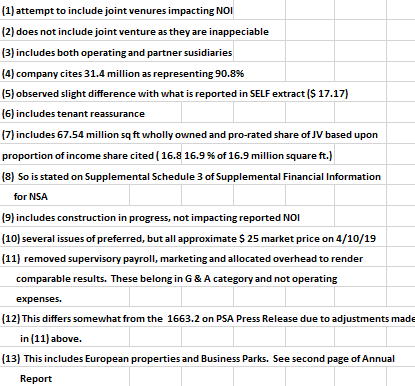 Next, please review again the summary table above wherein a raw price per square foot of operating self-storage property is computed for an investor in each of the six REITs. Note that the range is from a high of $257.98 per sq. ft. at EXR to a low of $60.07 at SELF, with the average of all non-SELF REITs at $192.98 per sq. ft. So, an investor in SELF is paying less than one-third of the price per square foot that he would pay if he invested the same amount equally distributed over the remaining five REITs. 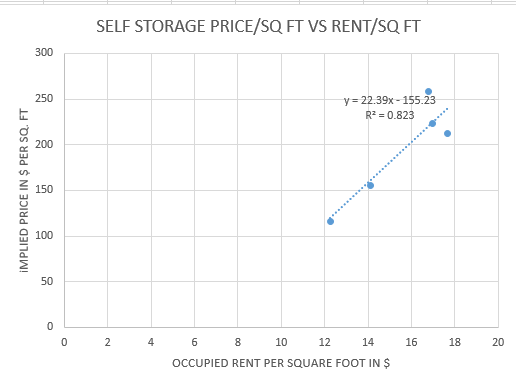 Now, let us subject the price per square foot versus the occupancy rent to a formal linear fit as shown below, leaving the anomalous SELF out. Just as we would logically expect, there is a highly significant relationship between the occupancy rent and the price per sq. ft. for self-storage REITs. Based on this metric, investors in SELF are buying real estate at a discount of 43.7%. The self-storage industry attracts many entrepreneurs. After all, it is nice to be your own boss with a predictable cash flow stream and ownership pride. However, if anyone has ever begun to review properties for sale, they start to realize how pricey decent properties have become. In fact, it is not easy to find an excellent quality property for a market cap rate of 6.80%, just what Global Self Storage pays as its regular dividend. Even if I could find a cap rate at 6.80%, then I'd have to quit my job as a faculty member and lose having my summers off. Moreover, managing a property is hard work. If, on the other hand, I just bought shares of Global Self Storage, then I'd probably have a better cash-on-cash return, anyway. Cap rates only account for operational expenses, not such things as might be classified as "G&A". Additionally, as an owner, I would not have the benefit of diversification over geography. Furthermore, the shares of Global Self Storage are much more liquid than the single property I might own for myself. 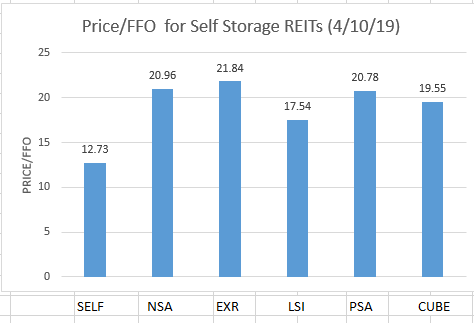 At the present time, the same cannot be said of the other five self-storage REITs since the highest alternative dividend rates are those of NSA or LSI, at 4.10%. That makes Global Self Storage unique in all the world. As long as even a single share of SELF remains at this depressed level, entering the self-storage business as an entrepreneur becomes irrational. 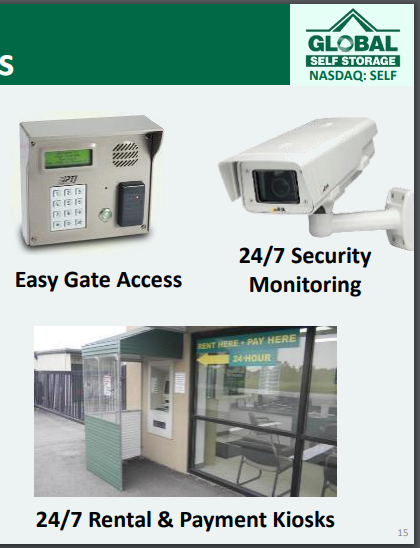 With 5,624 self-storage units, 7,692,624 shares outstanding, and a price of $3.82 per share, I can acquire my self-storage units for $5,226 each. In fact, ownership in a high-quality 200-unit facility is mine for only $1,045,200, with management and financing included. I, sort of, hope the SELF shares continue to languish at these ridiculous levels indefinitely. Then, I'll have my 200-unit facility in no time, and I'll keep my summers off. 4. 43.7% based upon price per square foot. We also argued that as long as the shares of SELF remain at these irrational levels, entering the self-storage business as an entrepreneur would be irrational. Disclosure: I am/we are long SELF. I wrote this article myself, and it expresses my own opinions. I am not receiving compensation for it (other than from Seeking Alpha). I have no business relationship with any company whose stock is mentioned in this article.